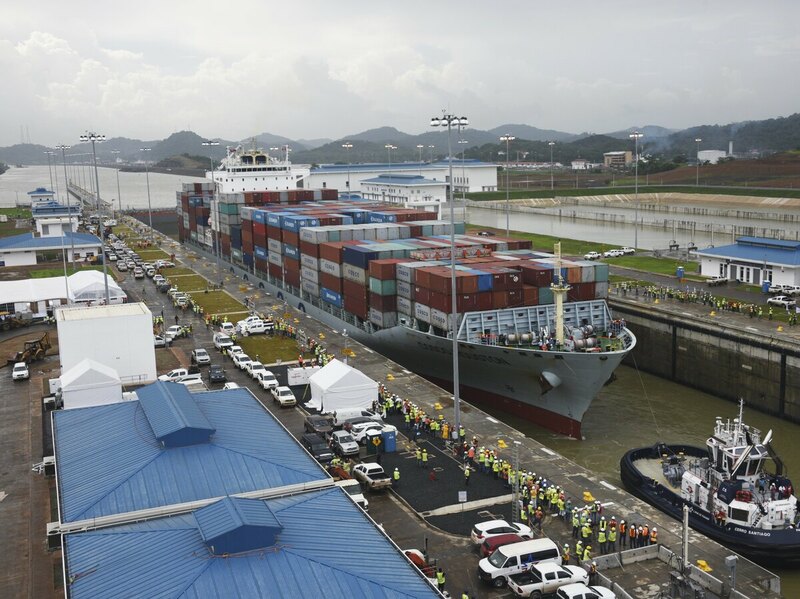 The $5 Billion Panama Canal Expansion Opens Sunday, Amidst Shipping Concerns Panama is celebrating the reopening of the canal. But people of the city of Colon have a different view of the waterway. They feel their city, the Atlantic gateway, doesn't receive enough benefits. Aerial view showing the new Panama Canal expansion at the Gatun Locks in Colon, Panama. Panamanian President Juan Carlos Varela is set to host an inauguration ceremony of Panama's newly expanded canal on Sunday. After more than $5 billion and close to a decade of construction, Panama opens the long awaited expansion of its storied canal. Set to potentially double its current cargo, the expansion has weathered cost disputes, serious questions regarding its design and a global slump in international shipping. Will the canal bring the benefits promised to this tiny Central America nation? The eyes and hopes of a country are all on Landon Rankin come Sunday morning. Rankin, who has more than 30 years experience piloting cargo ships, will guide one of the world's largest vessels through the just completed expanded Panama Canal. "It's a challenge ... and I am excited about that," Rankin says, speaking from his office at the Panama Canal Pilot's union hall in the capitol. Rankin says the challenge is just the latest for the Canal expansion, which is more than two years behind schedule, at least $1 billion over budget and prompting serious questions about its feasibility. The opening, originally scheduled for 2014, to coincide with the centennial anniversary of the existing canal's inauguration, comes at one of the most difficult financial times for the shipping industry. Shipping costs have plummeted as international trade falters, in part due to the economic slowdown in China. That slump wasn't part of the calculation when Panama took on expanding the canal back in 2007, just one year before the global recession hit. What it did see back then was an industry moving toward bigger and bigger ships that would no longer fit through Panama's existing locks and growing competition with the Suez Canal. Anders Boenaes, vice president at Maersk, the world's largest shipping company says Panama had to expand the canal to stay competitive. "They would have probably maintained the current level of activity at best by not doing it, but now by having done it they can win back what was changed to the Suez over the past five, eight, 10 years." The cargo ship Cosco Houston crosses the new Cocoli Locks during a test at the Panama Canal on June 23, 2016. The canal's expansion project will be officially inaugurated on Sunday. Then there are the worries over water. Will there be enough? Annual rainfalls while high in Panama, are not guaranteed. This year's rainy season came late. Many point to El Niño as the cause, but the water shortage prompted the Canal Authority to impose weight limits on ships coming through the existing locks three times times this year. Engineers added a unique water saving design to the new locks. Three basins, operating via gravity, will fill and empty into each of the three new locks, reusing up to 60 percent of the water. 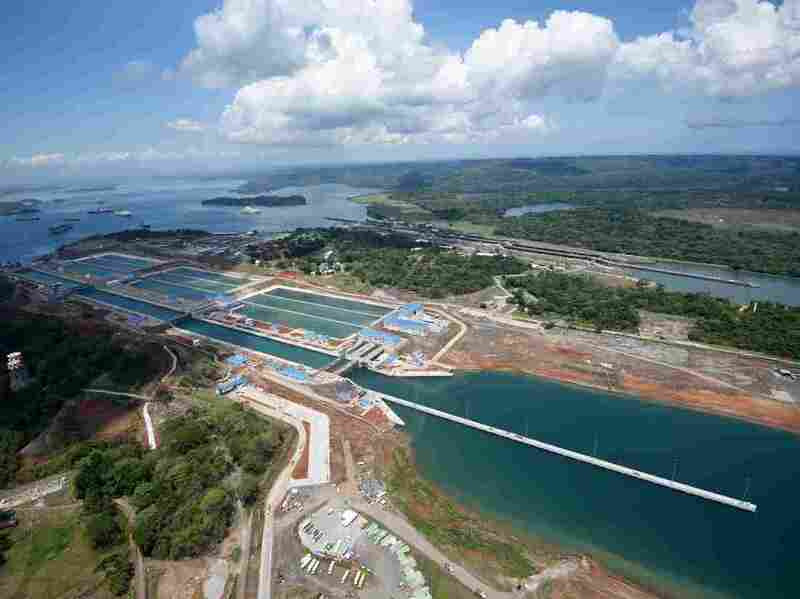 But despite that recycling, Panama's artificial Lake Gatun, the source of canal and much of the country's drinking water, will have to provide twice as much water to operate both the original and new locks of the canal. Perhaps the biggest concerns have come from the pilots who will maneuver the huge so-called neo-Panamax ships through not only the new locks but also the soon-to-be more congested shipping lanes and what's known as Corte Culebra — a narrow passage with many tight turns and sheer rock walls. Panama Canal Pilot Association President Londor Rankin says the margin of error in the new locks is very small. There is little room left in the 1,400 foot-long locks, when you have a 1,200-foot ship, and two 100-feet tug boats at each end. Rankin was hoping for longer locks. "It's not what I would have liked, but it's what we got," he says. Panama's Canal Authority insists pilot training either through classroom, simulators, in the actual locks and shipping channel has been top notch. And authorities stress water conservation as well as increased storage capacity in Lake Gatun, will insure sufficient supply to the expansion. As the digital countdown clocks set up around town tick down to zero, and the first neo-Panamax ship, from the Chinese Cosco company, slips into the expanded locks, this country will celebrate. Tens of thousands of free tickets were handed out to the public and jumbotron TVs will be out in four cities around the country for citizens to watch the official ceremonies. Entering Panama City's, and Central America's only subway, Saturday, Mara Pinera, says her country's prosperity and innovation is the envy of others in the region. "We are the bridge to the world and the heart of the universe," she says, quoting an old promotion campaign and beaming with pride.